The very first time I ever had dim sum was at Tremendous Chinese Restaurant in Mississauga while attending Humber (for music) almost eight years ago. 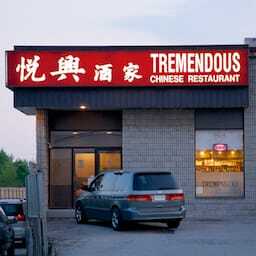 A bunch of us would hop into a car and make the drive all the way to this obscure place in Mississauga for dim sum. Why so far? Because it was ridiculously cheap! Everyday before 1pm, each item was only $1.11 and only went up a couple cents until 4pm when regular prices would kick in. That was eight years ago, but even today they have a similar setup – on weekdays before 4pm, dim sum is only $1.80 each and just $2 on weekends. Cheap! I’ve wanted to go back to Tremendous Chinese Restaurant for quite some time, not for nostalgic reasons, but to compare it with the many other dim sum places I’ve been to since then. Sure it was cheap, but how’s the food? The Shrimp Rice Rolls ($3.10) were the worst of the lot – there was hardly any shrimp (the shrimp were super tiny) and it was mostly rice dough that was both too thick and too sticky. The Deep-fried Shrimp Rolls ($2.60) on the other hand, were full of shrimp, the oil was noticeably clean/fresh and they were fried to perfection – not over-done at all. Very delicious! The Beef Tripe ($2.40) was a little too chewy and absent of any heat/spice (it’s better when they steam this with chopped jalapeño), and the wrapper on the Steamed Har Gow ($2.40) was a tiny bit too thick and sticky. Not so much that it was gross and inedible, but enough to notice it. The Steamed Spare Ribs ($2.40) and Pork Siu Mai ($2.40) were both prepared traditionally – nothing spectacular nor out of the ordinary. There are many great dim sum places in the GTA – I wouldn’t consider Tremendous Chinese Restaurant to be one of them, but their prices are definitely a great bargain. Apart from my comments on the crab claw and shrimp rice rolls, keep in mind that I’m being super picky in my criticisms – for the most part, the dim sum at Tremendous Chinese Restaurant is decent and respectable. So, a little over a week after that visit, we found ourselves in the far west-end of Toronto again and were looking for somewhere to eat. I was badly craving the spicy deep-fried har gow anyways, so we once again made the drive to Mississauga to take in some more of Tremendous Chinese Restaurant’s cheap dim sum. You can see from the photo below (taken with an iPhone) that we stuck to the basics and ordered pretty much the same things. The only new thing we ordered was the deep fried shrimp dumplings which were very well made and once again, the frying oil was noticeably clean and fresh. The accompanying mayo sauce was noticeably sweeter than I’m used to, but in a good way. For the price, most of the dim sum at Tremendous Chinese Restaurant is a good bargain. Their spicy deep-fried har gow alone make spending the gas to drive from Toronto worth it. And if you get lost on the way there, don’t worry, they don’t close until 5am. Tremendous Chinese Restaurant was published on Thursday, July 19, 2012 at 7:05pm EDT by Daniel Menjívar and last updated on April 11, 2018 at 9:30pm UTC .